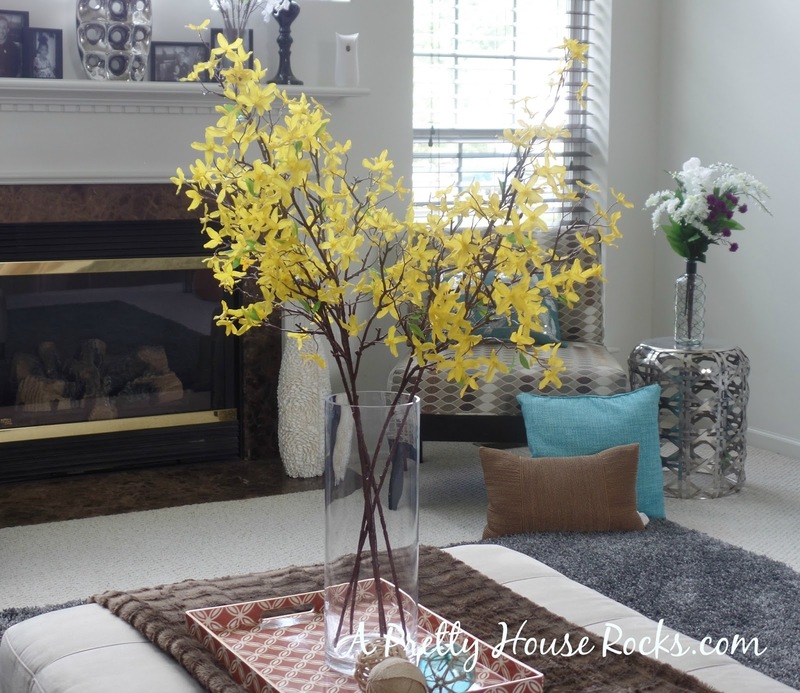 Yellow artificial forsythia flowers is a great way to add a pop of color! Break out the sunscreen and Maxi dresses...because spring has finally arrived and summer is right around the corner. I love this time of the year, before it gets sooooo hot you don't even want to step a single flip flop outside! So now is the time to "spring" out your home...on a budget of course. You need to save some money for that great summer vacation, right? Anyway...there are so many simple way to add some spring decor, such as; incorporating some color, adding new pillows, flowers, replace your linens and draperies. I usually get inspired by Pinterest, blogs or visiting many of my favorite stores to get ideas and sometimes the latest trends. 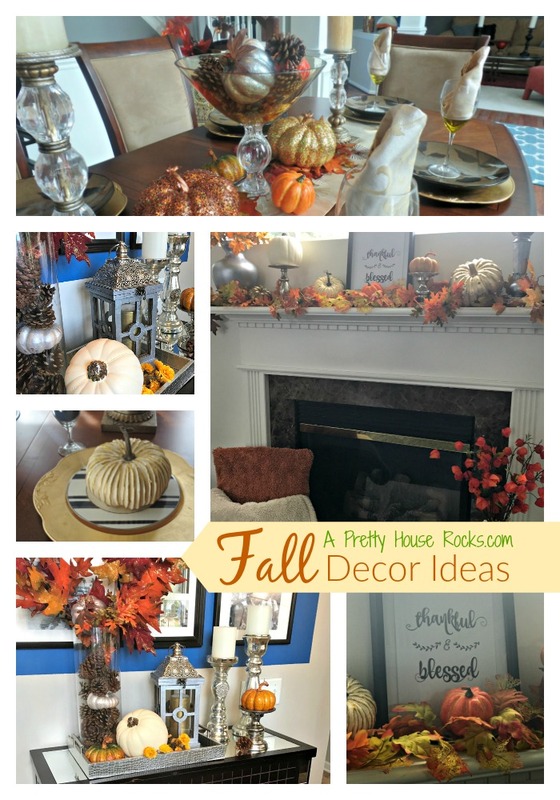 It is often so easy to recreate some of the expensive decor with a budget friendly imitation that still looks good! I bought these yellow artificial Forsythia flowers from Michaels....on sale for $2.90 a branch. Another more expensive chain has a similar look for $12.95 a branch. I love how the yellow flowers brightens up my family room below. You can't go wrong with Blue pillows from Kohls and HomeGoods. The accent table is from Target. The white flowers were a purchase from Joanne's last spring. It's super cheap to decorate with your own stuff! The fireplace mantel is another tool to display some spring decor. Adding blue candles, silver candle holders and a plate I bought from HomeGoods. 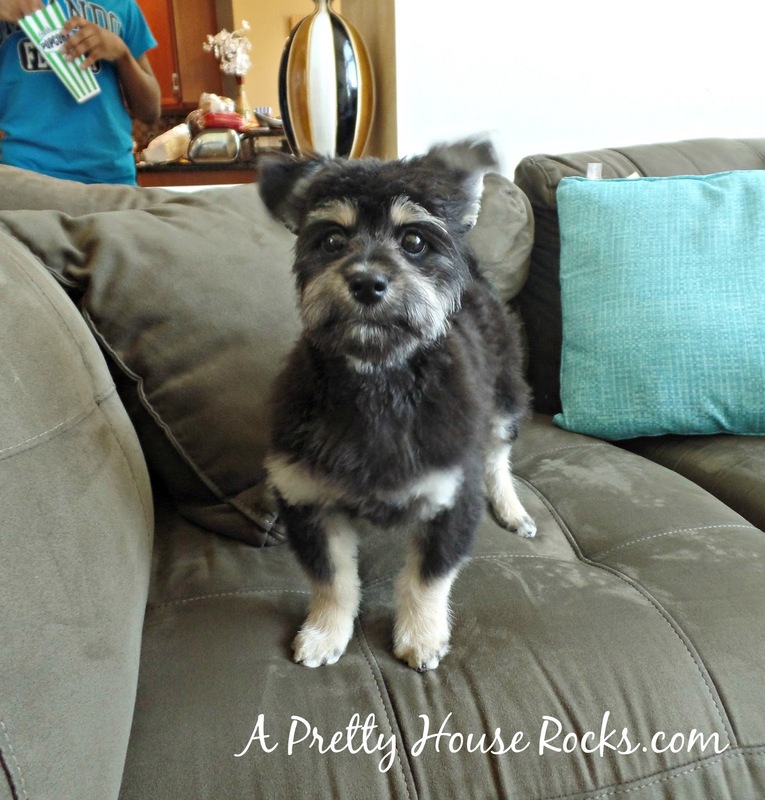 This little cute pup is a spring purchase that has definitely brightened our decor and our lives!!!!!! The blue and green artificial flowers were an item I bought a year ago from Joanne's Fabrics. Replacing the pillows on my sofa is always a great way to change the decor every season. I hope these pictures have inspired you to "spring out" your home! Come back and visit, I'm working on my dining room next. Thanks for visiting!